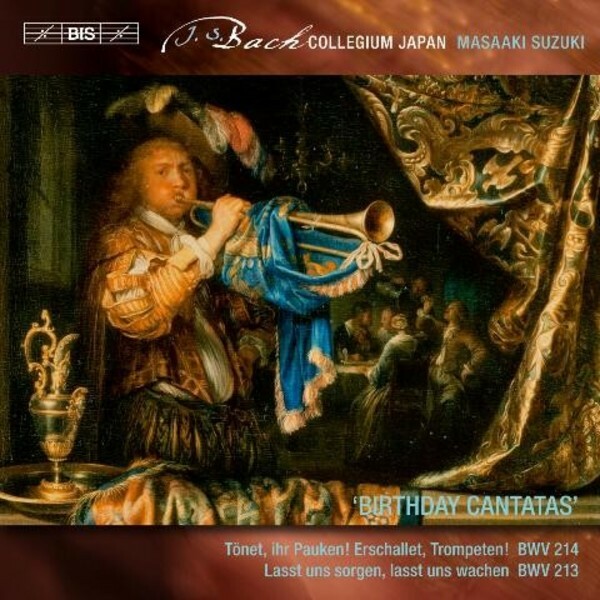 Continuing their exploration of J S Bach’s vocal music, Bach Collegium Japan and Masaaki Suzuki have now reached the fifth volume of secular cantatas, with the previous instalment being ‘urgently recommended’ by the reviewer in Fanfare, and its contents described as ‘unusually colourful and vivid […] even by the standards so far set by Suzuki’s Collegium Japan’ (International Record Review). Both cantatas on the present disc, first performed in 1733, appear to have been part of a campaign to be appointed Court Composer by the Saxon Prince-Elector Friedrich August II. Lasst uns sorgen, lasst uns wachen, BWV 213, also known as 'Hercules at the crossroads', was composed for the 11th birthday of the Prince-Elector’s oldest son, and Tönet, ihr Pauken! Erschallet, Trompeten! BWV 214 in a similar manner celebrated the birthday two months later of his wife, Maria Josepha of Saxony. Both works are so-called ’dramma per musica’, in which the vocal soloists are embodying dramatic characters – in the present cantatas these are taken from Greek mythology. Needless to say, Bach rose to the festive occasions, deploying trumpets and timpani (as implied in the title of BWV 214) and horns (in BWV 213) to great effect.